Hi, I’m Meg Schwamb a postdoctoral fellow at Yale University and member of the Planet Four Team. The response from BBC Stargazing viewers has been amazing and we want to thank all of you for participating in the project. Thanks for helping us explore the surface of Mars and study the seasonal processes ongoing on the fourth planet from the Sun. 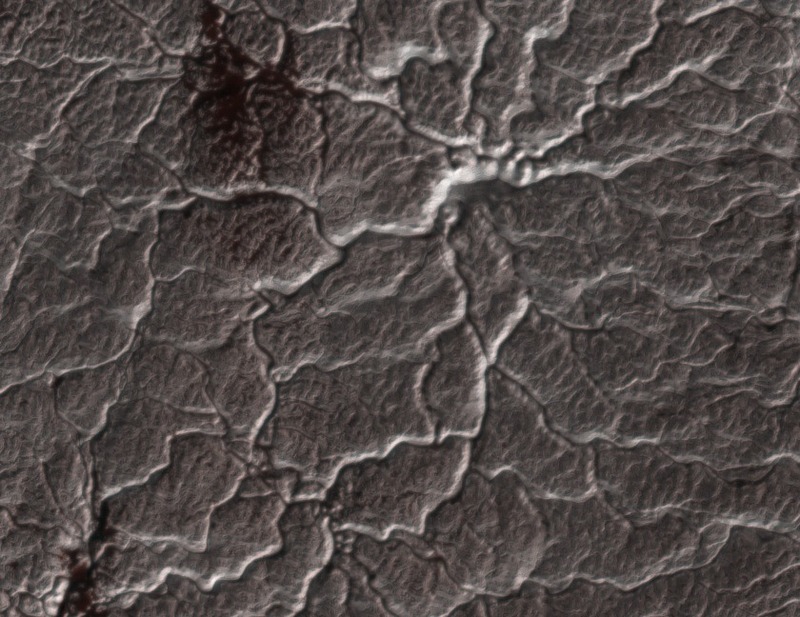 The images we’re asking you to classify come from HiRISE (High Resolution Imaging NASA’s camera on NASA’s Mars Reconnaissance Orbiter (MRO). 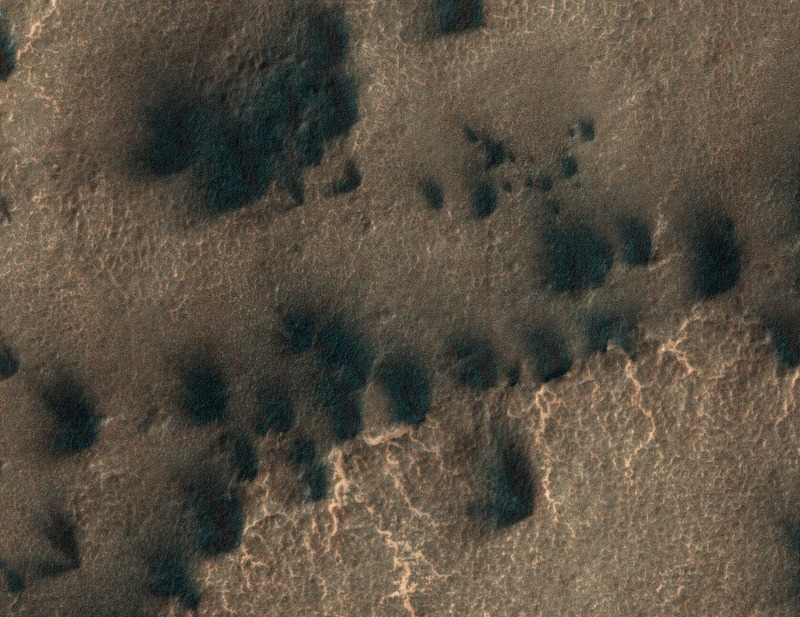 MRO has been orbiting Mars since late 2006. HiRISE is a high resolution camera that is capable of seeing features the size of a dining room table on the surface of the Red Planet. This camera has been giving us the most detailed images of Mars that we can use to study how the surface changes with differing seasons and explore the geology of Mars from orbit. 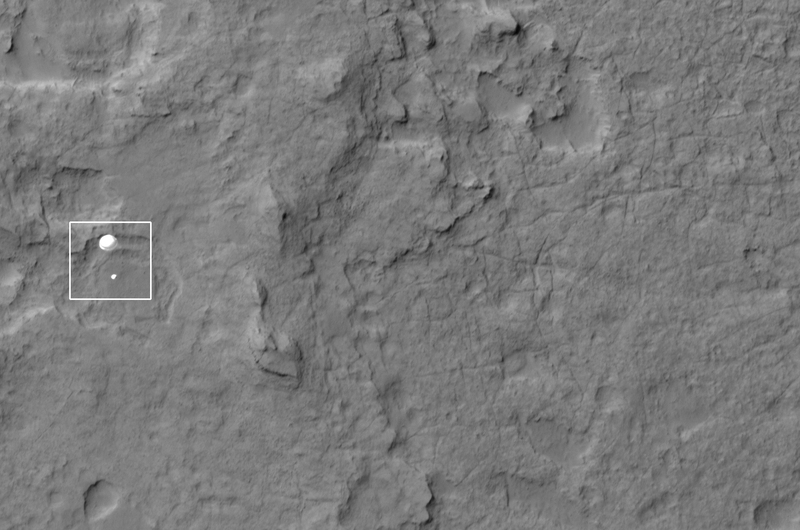 In addition MRO has helped keep rovers like NASA’s Curiosity ad Opportunity safe, with the capability to identify large rocks at potential landing sites that could damage a rover during landing.You might already be familiar with HiRISE images. 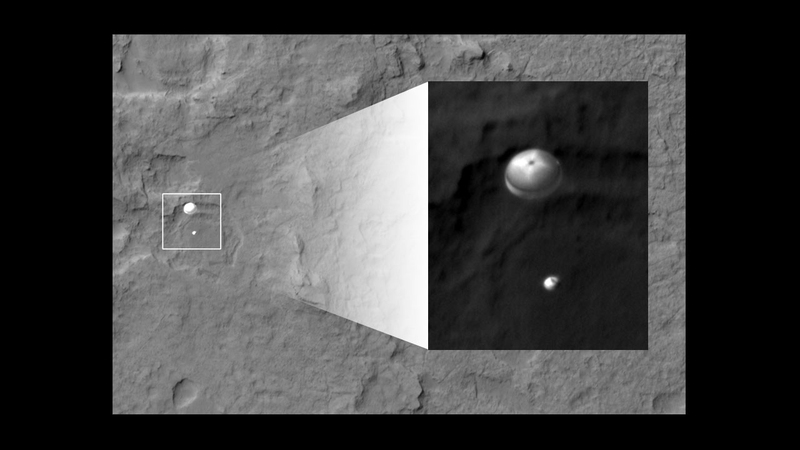 MRO and HiRISE caught Curiosity on August 5, 2012 in the act as it was parachuting down to the surface to it’s future home at Gale Crater. 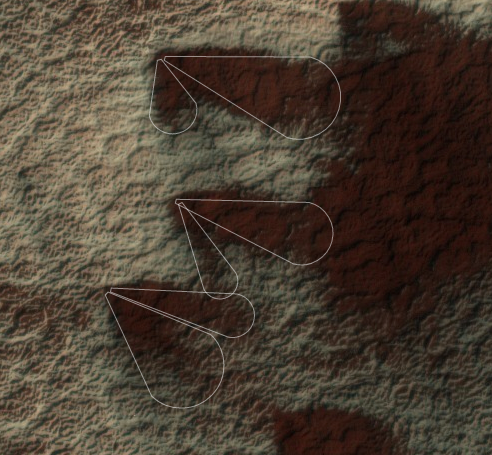 On Planet Four, you’re seeing images of the South Pole of Mars. 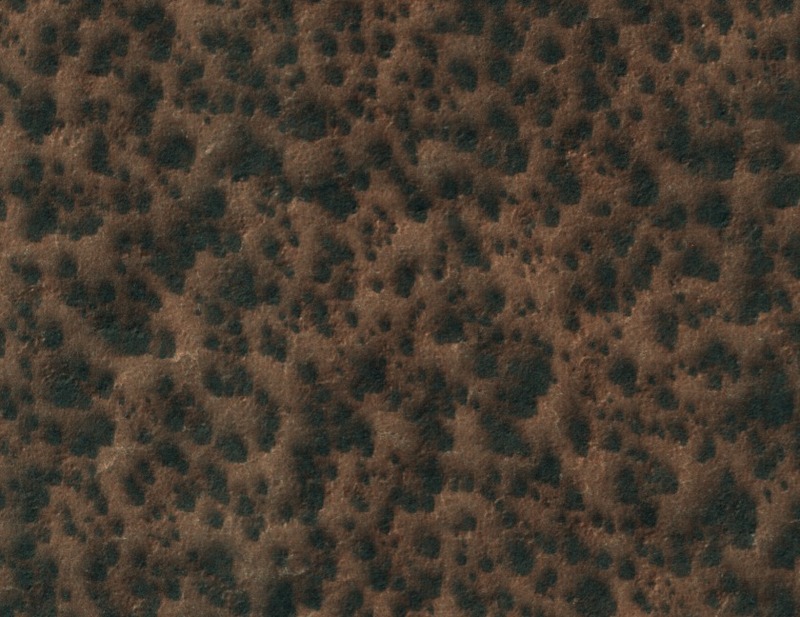 We are asking you to mark these beautiful dark fans and dark blotches that appear and disappear during the Spring and Summer on the South Pole of Mars. During the winter carbon dioxide (CO2) condenses from the atmosphere onto the ground and forms the seasonal ice sheet. The ice begins to sublimate in the spring, and the seasonal cap retreats. 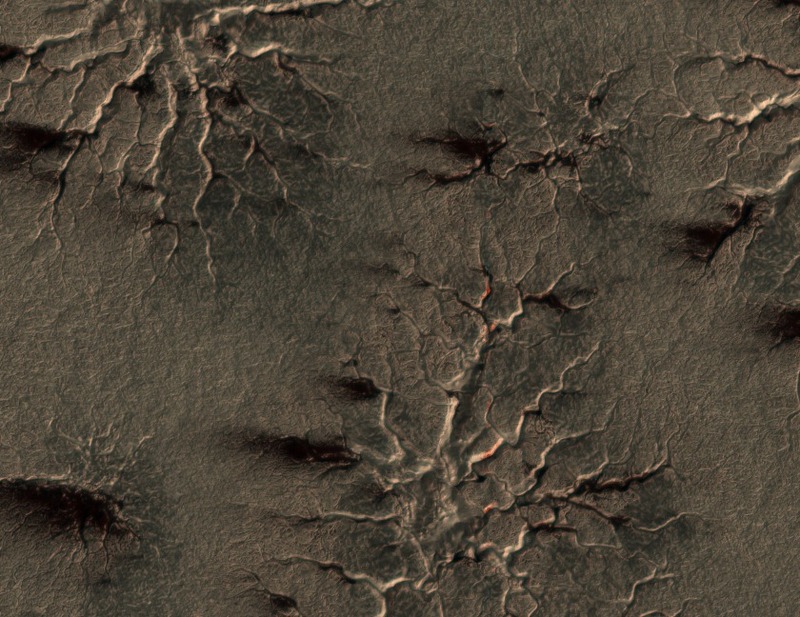 There we see over the Martian spring and summer these dark fans and blotches. They begin to appear in the Southern spring when the ice cap begins to thaw and sublimate back into the atmosphere. The fans and blotches then disappear at the end of the summer when there is no more ice left. Later in the spring/summer season as the ice thins that we see these channels have been carved in the surface. Many originate from a single point and radiate outward. Others just like a patches of swiggly lines crisscrossing or in orderly rows. Those ridges are channels in the soil that are sculpted by carbon dioxide gas. 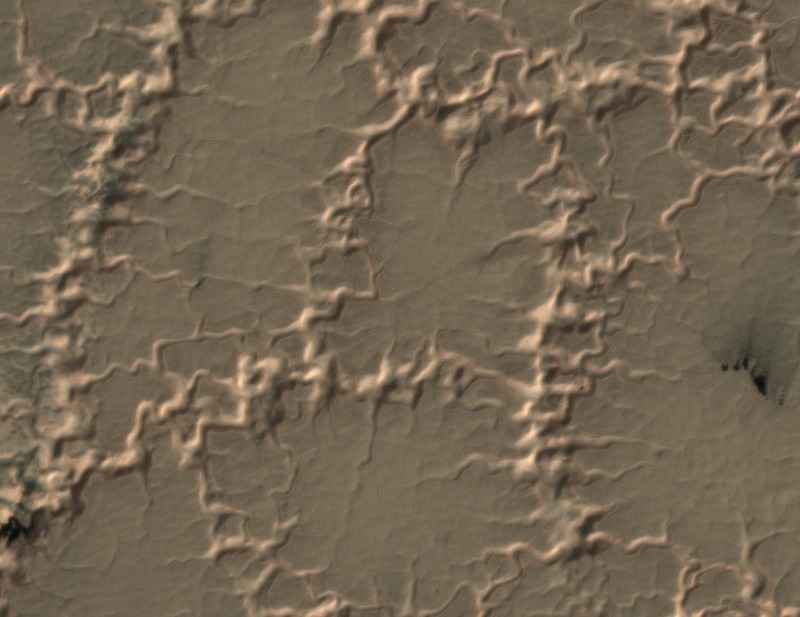 These veins in the images are what we call “spiders” or araneiform terrain. Here’s how we think they form: In the spring/ summer when the sun come up the sun heats the base of the ice sheet the ice sublimates on the bottom creating carbon dioxide gas that carves these channels or spider-like features. The trapped carbon dioxide gas is rushing around the bottom carving these channels and tries to exploit any weaknesses in the ice sheet. If it can the gas propagates through cracks in the ice sheet the gas escaping into the atmosphere in geysers. The gas bringing along dust and dirt to the surface that we think get blown by surface winds into the beautiful fans we ask to mark or if no wind the blotches we ask you to map. This morphological phenomenon is unlike anything seen on Earth. You can learn more about all of this process we think is happening on the surface in our previous blog post. We want to study how these fans form, how they repeat from Spring to Spring and also what they tell us about the surface winds on the South Polar cap. We only have very few limited wind measurements from spacecraft we’ve landed on Mars. If the fans are places where the wind is blowing, then they tell us the direction and the strength of the wind. 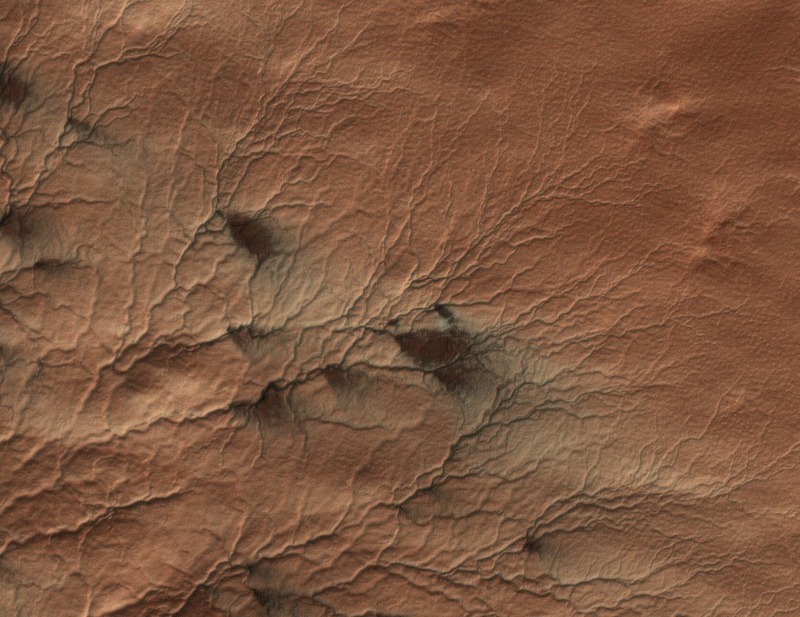 Blotches then tell us where there is no wind.Your mapping of the fans and blotches would help provide largest surface wind map of Mars. Over 10,000 participants worldwide have helped classify 340,052 MRO images. But we still need your help. There are many more images still waiting to be mapped. Help us out at http://www.planetfour.org/ today.